IMG Fashion partners with Rightster to deliver Live Streams of all Runway Shows from Mercedes-Benz Fashion Week at Lincoln Center for the first time ever. New York, NY (Feb. 1, 2013) - IMG Fashion and Rightster announce that for the first time, there will be a live stream of every runway show from Mercedes-Benz Fashion Week at Lincoln Center, as well as video on-demand content available for all shows and presentations, for fashion enthusiasts everywhere. 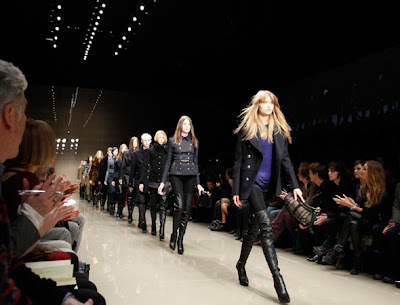 In collaboration with worldwide media content and distribution authority Rightster, this exciting program will make live streams available on newyork.mbfashionweek.com and facebook.com/mbfashionweek, giving fans worldwide a front row seat to fashions most beloved designers’ shows. 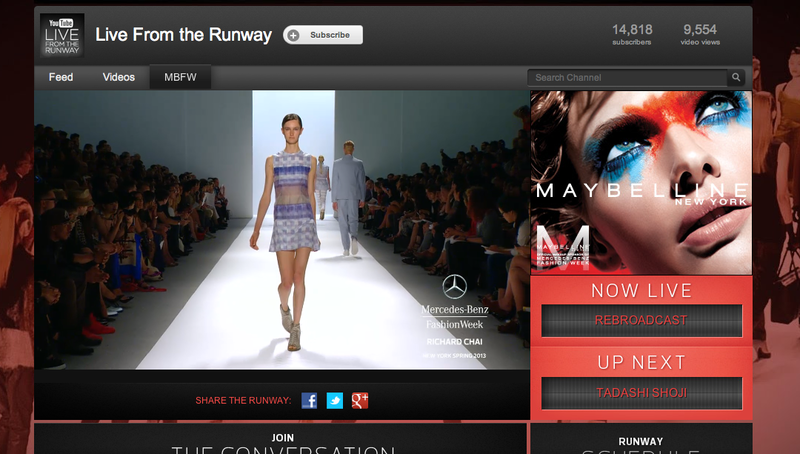 The live streams and on-demand videos will also be available to digital media and online publishers at video.mbfashionweek.com, providing a streamlined system to access more content in one portal than ever before. This collaboration adds to the IMG Fashion portfolio of solutions for designers to connect with their consumers around the globe. “We are extremely excited to continue our successful partnership with IMG Fashion for a second consecutive season. Together, we are able to increase access to the fashion world’s most exciting live and on-demand video content. Rightster makes the task of efficiently distributing, promoting and securing advertising for online video content as easy as possible for fashion designers, media properties and brands, ultimately increasing digital media engagement and enabling them to reach the widest audience possible” said Charlie Muirhead, Founder and CEO at Rightster. Media will have the ability to enhance their own coverage and engage their audience with rich video content by simply embedding the live stream. Last year, IMG Fashion and Rightster’s distribution of live streamed shows resulted in a 165% increase in viewership, allowing fashion lovers around the world to view the runway via their favorite websites. Designers participating in Mercedes-Benz Fashion Week will benefit from additional distribution avenues enabled by the IMG Fashion and Rightster collaboration, and media outlets without their own crew will be able to deliver live exclusive coverage so that the designers’ reach will extend to an unprecedented audience size worldwide. The designer shows that will be included in the live stream are: NICHOLAS K, BCBGMAXAZRIA, RICHARD CHAI LOVE and RICHARD CHAI MEN’S, TIMO WEILAND WOMEN’S, TADASHI SHOJI, SERGIO DAVILA, CONCEPT KOREA, CZAR BY CESAR GALINDO, CARMEN MARC VALVO, NOON BY NOOR, NAUTICA, REBECCA MINKOFF, NICOLE MILLER, ACADEMY OF ART UNIVERSITY, PARKCHOONMOO, RUFFIAN, LACOSTE, JILL STUART, SON JUNG WAN, MARA HOFFMAN, HERVÉ LÉGER BY MAX AZRIA, KATYA LEONOVICH, MONIQUE LHUILLIER, VENEXIANA, LELA ROSE, TRACY REESE, CUSTO BARCELONA, DIANE VON FURSTENBERG, JOANNA MASTROIANNI, VIVIENNE TAM, RALPH RUCCI, EMERSON BY JACKIE FRASER-SWAN, ICB BY PRABAL GURUNG, CAROLINA HERRERA, PAMELLA ROLAND, KAUFMANFRANCO, BETSEY JOHNSON, REEM ACRA, BADGLEY MISCHKA, VERA WANG, JENNY PACKHAM, NAEEM KHAN, DENNIS BASSO, VANTAN TOKYO, BIBHU MOHAPATRA, MICHAEL KORS, NANETTE LEPORE, RACHEL ZOE, J. MENDEL, MILLY BY MICHELLE SMITH, FALGUNI AND SHANE PEACOCK, ANNA SUI, ZANG TOI and B MICHAEL AMERICA. Title sponsor Mercedes-Benz is joined by DHL, American Express®, Maybelline New York, TRESemmé, Style Network, WGSN, Fiber One® Bars, Samsung Mobile, Beck’s Sapphire, The New York Times, Women's Wear Daily and Getty Images. Mercedes-Benz Fashion Week is an IMG event. why do all these models have that angry, blank stare on their faces? or is that the look one has when thinking about a double cheeseburger with fires and a dr pepper?